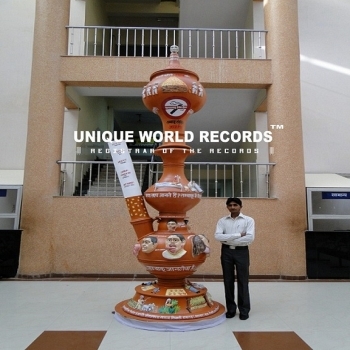 Meet here Mr. Om Prakash Galav proprietor, Ramgarh Clay Pottery and our other artists. Here you can get our some products those are handmade and best in quality. 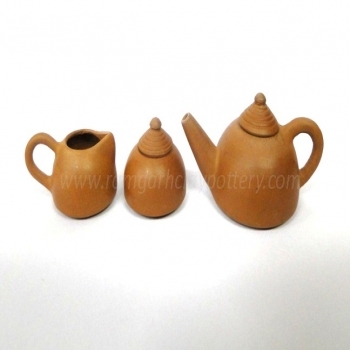 We produce Terracotta miniatures of pots, Tea-set, Hookah, surahi, Lamp etc. These miniatures are so beautiful that’s why people want to collect these miniatures for collection and gift to their friends. These miniatures are not easily available in markets. Alwar is known for “Kagzi Pottery” (as it is made with a thin layer of clay). It is very light in weight. Other thing is that it requires a lot of experience, patience, fineness and designing skill at the same time. The shape and design are basic which depicts the art of Pottery Making in our society. 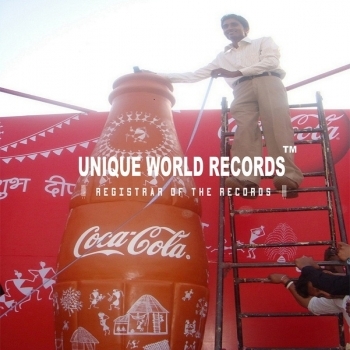 Due to Modernization this “Art” is fading from our society and our artists are trying their best to revive it. This uniquely designed night lamps are Made of Terracotta, The design produces a glorious look to the products itself, and it has the ancient Indian warli art on it. It adds a charm and glam to your room. The bases of lamp are made from terracotta and the shade is made up of cloth wrapped around plastic. The shade is also hand painted keeping in mind the color coordination with the terracotta lamps. Tea-Lights are especially popular for use with candle holders for more elaborate light, Tea-Light come in a wide range of styles, colors, and shapes. Handcrafted and hand painted terracotta vase with madhubani, warli , and other painting style surely bring a new style to your home. These vases enhance the aesthetic appeal of your living spaces. We produce terracotta crockery like casserole, tea pot, cups etc. Traditional terracotta cooking pots are used all over the world. Our terracotta crockery can be use in microwave. Terracotta Statues like Buddhas, Bani-Thani, Ganesha are unique pieces of artwork. We offer Terracotta Statues those are generally used to give a traditionally look and also make for perfect gifting items. We produce Traditional designs in contemporary requirement and also produce antiques art pieces of terracotta.